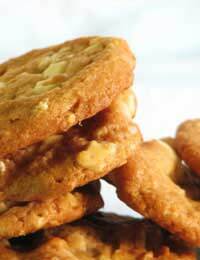 Using nuts in cake and biscuit recipes is a pure pleasure as they are such a versatile ingredient. In these sugar free recipes the nuts all bring both extra texture and flavour to the biscuits.Try using nuts in a ground form, to give your biscuits a little more depth. Or try using large pieces of walnut, hazelnut or pecan for added interest and bite. This is a nice flavoursome biscuit. The honey flavour works well with the pecan. Preheat your oven to 180 deg C/350 deg F/gas mark four. Melt your honey and butter in a small pan over a low heat. Sieve your flour and bicarbonate of soda into a bowl. Stir in the hot melted liquid. Add your vanilla essence. Beat your egg in a small bowl then stir that in too. Add your pecans. Roll into a dough, wrap in cling film and place in the fridge to chill for an hour or so. Then roll into small balls, place on a lightly greased tray and press down on each with a fork. Bake in the centre of the oven for about 10 minutes. Remove and leave to cool. This is a popular biscuit with children and adults alike. Make sure you buy peanut butter that does not have any added sugar. Preheat your oven to 180 deg C/350 deg F/gas mark four. Take your sugar free strawberry jam, margarine and peanut butter and mix well together. Beat your egg and stir into the mixture. Sieve your plain flour and baking powder, and stir in until you have a very solid dough. Then roll into small balls, place on a lightly greased tray and press down on each with a fork. Bake in the centre of the oven for about 15 minutes. Remove and leave to cool. This is a tasty choc-nut recipe. The hazelnuts can be changed for any other nuts that particularly take your fancy. Preheat your oven to 180 deg C/350 deg F/gas mark four. Take your sugar free strawberry jam and beat well with your margarine and hazlenuts and mix well together. Beat your egg and stir into the mixture. Sieve your flour and cocoa powder, and stir in until you have a dough. Lightly dust a clean surface with flour and roll out to about one cm thick. Cut into circular shapes using a cookie cutter.